John H. Mullan is an attorney with the Corporate Practice Group and was formerly Corporate Vice President and Secretary of a New York Stock Exchange-listed company. Mr. Mullan's principal areas of practice are securities matters, including public disclosure and compliance and advice on corporate governance and processes. 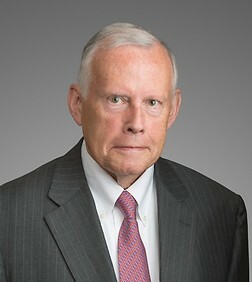 His practice includes advice and representation of Boards and Audit Committees; public reports, proxy statements and related filings; assembly and coordination of teams of advisors in relation to tender offers and proxy contests; and a broad range of matters relating to acquisitions, divestitures and credit agreements. Mr. Mullan advises publicly traded corporations with operations primarily in the technology and manufacturing sectors. He spent over 30 years with Northrop Grumman Corporation, including 19 with Grumman Corporation, and handled merger and acquisitions, securities, corporate finance and corporate secretarial matters, including presentations and resolutions for the Board of Directors and its Committees. Merger and acquisition experience included the sale of Grumman's Gulfstream executive jet division and its transit bus, yacht and boat subsidiaries and the acquisition by Northrop Grumman of Westinghouse Electronics, Litton Industries and TRW, Inc., among others.